I watched SHERLOCK HOLMES: A GAME OF SHADOWS (2011) on 7.3.13. It was my first viewing of the film. Overall, I had a few complaints about the first SHERLOCK HOLMES, a movie I generally liked. My major issues were with the CGI look of the outside London world and the generic clues Sherlock uncovered which seemed to come from a random Wikipedia search. On both of those fronts, the sequel is a more successful film. The CGI is improved and often replaced with actual, you know, exteriors of real building and real things. That’s a nice upgrade. While the clues are somewhat obscure, my subjective opinion is that they are much more deducible, even if I wouldn’t have deduced them myself and deducable is not a real word. But, choices such as providing a book on keeping plants alive mirrored by the fact that the villainous Moriarty (Jared Harris, a great addition) can’t keep a simple plant alive leading to Sherlock suspecting that the book has an alternative purpose? Well that is both a smart plot choice by the filmmakers and a poorly worded sentence by me. I enjoyed this film plenty. 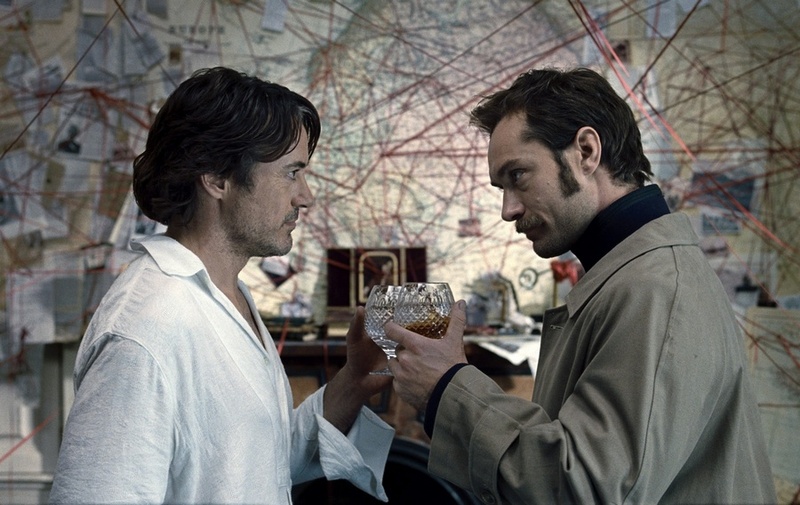 Robert Downey Jr.’s Sherlock and Jude Law’s Watson are as wonderful together as they were the first time. I appreciate the hard decision made with the character of Irene (Rachel McAdams) as well as the silent moment Watson and Holmes share when Watson has learned her fate. Her shadow could have been carried a little further through Sherlock’s character arc (for such a wreck of a man, he sure doesn’t seem to get moody… only more eccentric). The added villains are a nice touch, though the protagonists who further the cause of Sherlock and Holmes are mostly forgettable. Worthwhile, especially, is what Moriarty adds to the story. This telling of the Holmes saga needs someone smart on their feet as well as being able to fight. This Moriarty is more the former, though the latter proves important as well in a scene which provides great payoff for two films in which Holmes visualizes a fight before engaging in one. We also get to see Holmes bested mentally, which adds to the stakes. The plot is forgettable. It has Moriarty setting up a World War, softened at least partly by the fact that an actual World War would happen 20 years after this movie takes place, so Moriarty not only can’t be successful, but he can’t even have an impact on the actual events of two decades down the line. But the plot doesn’t really matter. We want to see Holmes engage in a battle of wits and a battle of fists with the eye-rolling help of his assistant Watson. We want to see some action, a bit of deduction, and we want to have a good time. This sequel delivers on all of that. I really don’t have any complaints, even if this isn’t a perfect film. ~ by johnlink00 on July 5, 2013. Oh and I love the humor you fetter into this site (saying that is the real reason I’m leaving a comment in a months old review, by the way). Thanks for stopping by! And thanks for the compliment!